I'll just come right out and say it- I'm obsessed with Lodge Bread Company. 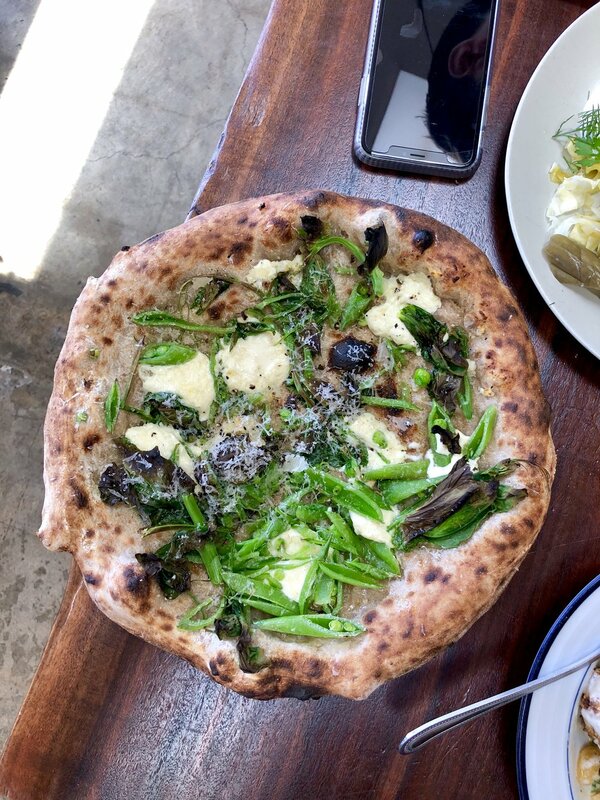 This bakery and café in west LA focuses on whole grain sourdough bread baking, freshly milled flours, and wood-fired pizzas, and truly impresses in all ways, if you ask me. 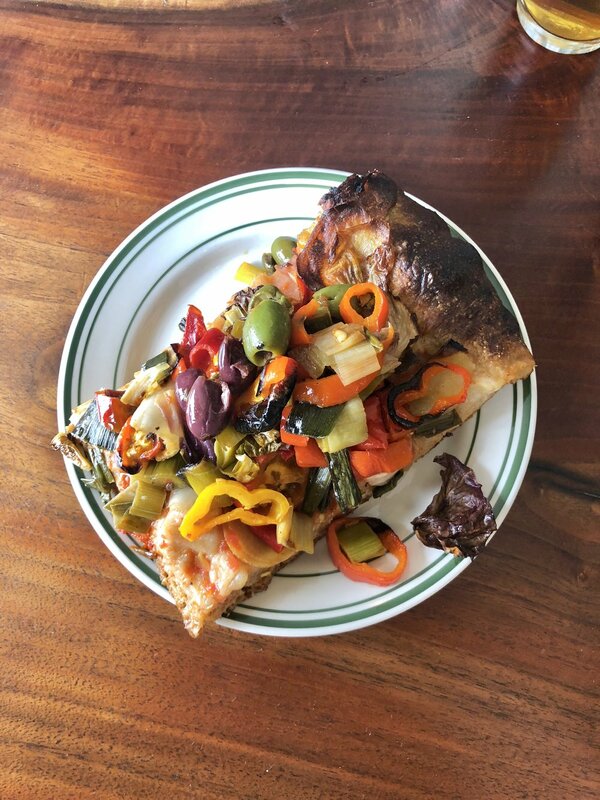 Every day, Lodge Bread churns out some seriously delish and hearty bread, unique pastries, and both Neapolitan & pan pizzas, not to mention some tasty wood-fired veggie dishes as well. It's truly everything I want in a meal- carbs and sweets! I'd been eyeing the (gigantic!) sourdough cinnamon roll ever since I first saw it on Instagram, and finally indulged on my most recent visit. It's not overly sweet, thanks to a lighter, whipped frosting and that hearty whole grain sourdough, but utterly delicious with the perfect amount of cinnamon flavor! Next on my must-try list is the babka! I've now gotten to try a good variety of things from the menu, and have yet to be disappointed. Upon first entering the bakery, after checking out the bakers handling the dough with such care , you'll find the beautiful array of pastries baked fresh that day. I highly recommend trying a couple (or five). Other than the cinnamon roll, the pine nut blondie and the carrot olive oil cake are to die for! 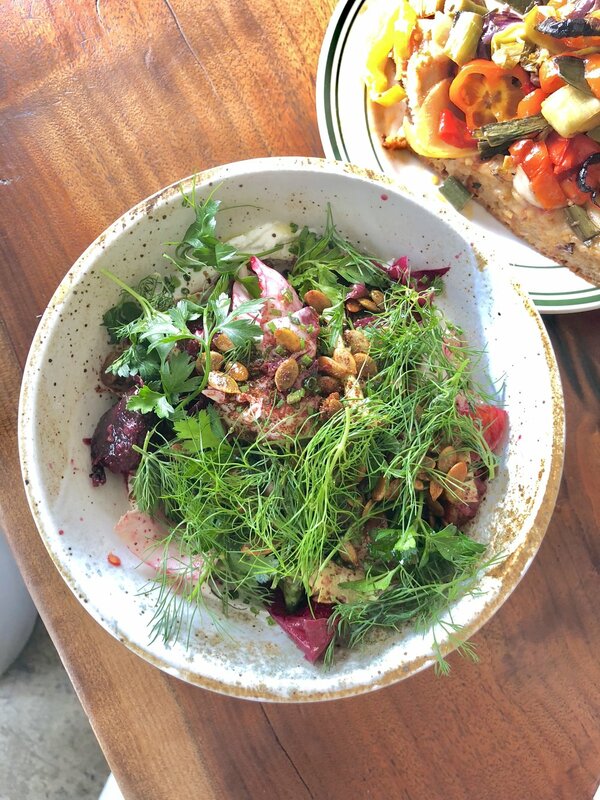 The wood-fired cauliflower with pickled raisins & chermoula is just bursting with flavor, as are the roasted beets with chicories, cara cara oranges, labne & pepitas. You can't come to Lodge without ordering pizza. Trust me, just do it. My pan pizza was thick and chewy, almost like a slightly crusty sourdough focaccia, piled high with roasted veggies. Our sweet pea pie was the perfect seasonal treat, topped with snap peas, pea tendrils, green garlic & ricotta! I'm now drooling again just thinking about this meal, so looks like a return trip is in my very near future!